A lot of music history has been made in the Ulster Hall. You lap it up the minute you walk in off Bedford Street. There, straight at you: a plaque on the wall saluting the great blues rock guitarist Rory Gallagher. Featured wonderfully in the recent punk feature film Good Vibrations the hall was in the limelight too, and scroll back to the worst days of the troubles and remarkably Led Zeppelin played ‘Stairway to Heaven’ live for the first time, in a hall more used to symphony concerts. Roll over Beethoven. “Give us a wee kiss, Gregory,” the lady near the front called out. Porter had a good crowd in mostly standing and he later told us that yes he was the most Irish person in the band! The charm was natural. 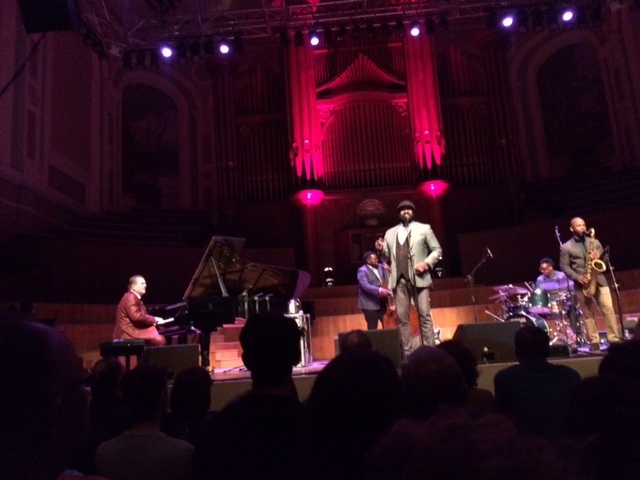 The New York-based Californian was beginning his Britain and Ireland tour ahead of the release of Blue Note album Take Me To the Alley, his follow-up to the big selling Grammy-winning Liquid Spirit and so this was when Belfast got to hear him first before anyone else on this tour. Van Morrison was sat in the audience up on a balcony watching and got a name check later in Porter’s ‘Musical Genocide,’ a roll of honour that also features James Brown and Marvin Gaye. The band is a little different to when Marlbank last heard Porter which was outdoors at Blenheim Palace last year during Nocturne. The Japanese alto sax player and flautist Yosuke Sato has left the band and instead there’s the Marcus Strickland-like tenor player Tivon Pennicott in his place, the lower instrument suiting Porter’s deep tones, and also on this occasion the addition of trumpeter/flugelhornist Chris Storr (who you might remember was in the fictional Louis Lester band on Stephen Poliakoff’s TV drama Dancing on the Edge) making a two-man horn section riffing and wailing at will to suit the songs. The rhythm section is the same as Blenheim, with veteran Porter pianist Chip Crawford, excellent double bassist Jahmal Nichols (later strapping on a bass guitar) and drummer Emanuel Harrold, in the pocket at all times. Porter sporting a waistcoat, wearing his trademark hat of course, stood tall centre stage and sang brilliantly, the best I’ve ever heard him. He has rewritten the jazz singer rule book in recent years and continues with new chapters added even on familiar songs. I was wiping away tears of joy by the end. The duet with Crawford in the poignant mixed-metaphor song ‘Water Under Bridges’ was perfect and Porter was highly engaged in the more uptempo material, a storming ‘Work Song’ easy for the tenor player, taking one hand off the sax even as he hit it grandly home.